LTHForum.com - The Bad Apple - More than just great burgers! 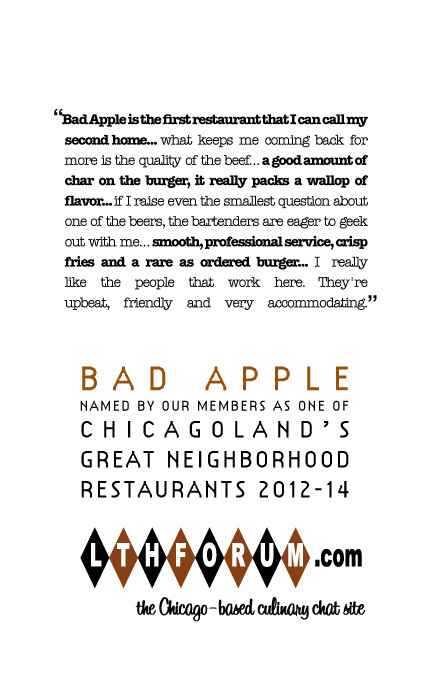 LTH Home > Chat > Great Neighborhood Restaurants > The Bad Apple - More than just great burgers! I apologize, it's a bit long. I was torn between a few places when deciding which to nominate. Though other restaurants may have benefited more from the attention of a nomination, I’d have been lying to myself if I said Bad Apple was not the place I appreciate most in all of Chicago. With such a friendly, welcoming atmosphere on top of the amazing burgers and beer list, Bad Apple is the first restaurant that I can almost call my second home, sometimes finding myself going there 3 times in a week. LTH loves burgers, so as with any burger joint there was a lot of buzz over bad apple on LTH when it first opened. Most of the posting being in early stages when it seemed to be getting it’s foothold. What was initially received as good, but inconsistent, has over the past few years turned into a rock solid, consistently great establishment. They are churning out expertly cooked, juicy, flavorful burgers at what I consider the best place in chicago to sit down to have a beer! What keeps me coming back for more is the quality of the beef. They order a custom blend of beef from Pat LaFrieda. It is unlike any other burger, in that it is leaner and, dare I say, healthier tasting. By that I mean that it has all the beefy flavor and juiciness I want in a burger, without leaving me feeling heavy like I just ate a bunch of beef fat. Being lean, they make it clear when ordering, that it’s best rare or medium rare, otherwise it will seem dry. The fancy burger "fixin’s" have really come into their own over time. The comparisons to Kuma's are unavoidable, but in my opinion Bad Apple really stands on their own. My two favorites are the Frenchie and the Belly Burger. The Frenchie which comes with Brie, spinach, truffle mayo, crispy onion. 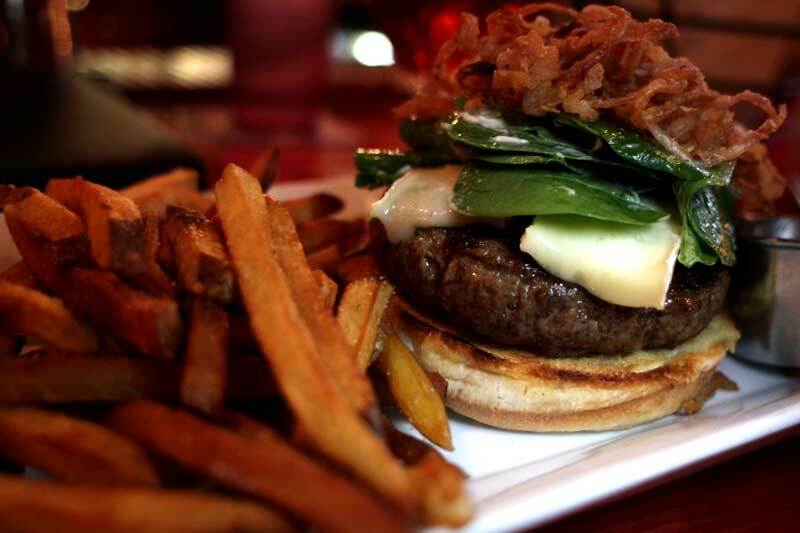 The flavor of the brie really punches through and compliments the burger, and the super crispy onions really pack a flavor and texture punch. The Belly Burger is topped with a couple thick slices of braised pork belly and an herbed horseradish sauce. The belly is fatty and melty, which texturally replaces the need for cheese. Being more of a fan of a simple burger, I appreciate that Bad Apple does some of their “fancy” burgers with subtlety. I also appreciate their sticking to the goal of keeping all of their burgers at $10 or less (one exception being the foie gras at $12). Though there has been much contention regarding the fries at Bad Apple, LTH seems to have devised a solution. When ordered standard they are a bit on the soft side, but are the most flavorful fries I’ve ever tasted. When ordered crispy, they are sufficiently crispy. After trying both, I think I'm going to stay in the camp that orders them standard. They really do pack a lot of flavor, which more than makes up for what they lack in crisp. Being a culinary website this makes sense that the focus of the burgers and fries trumps the beer, but to me a good beer is an important element to enjoying my burgers. Bad Apple offers one of the largest selections beers, having 25 taps rotating only craft and micro brews, as well as a bottle list with over literally hundreds of bottles to select from! A quick glance at beermenus.com will reveal that bad apple’s prices are usually the best price per oz you can get in the city. Bad Apple epitomizes the differentiation between simply a great restaurant and a great neighborhood restaurant. What makes this a neighborhood restaurant is the friendly, knowledgeable staff in a very comfortable setting. The staff is not just knowledgeable, but actually passionate about the food and the beers. Separated into 3 rooms, you can have your pick of atmosphere. The front having the bar with dominating pieces of bizarre art covering the walls. The bar is where you want to sit to chat about beer with the staff. The rear room being more dinner oriented with lots of tables. This is where you’d go with a family or for a quieter dinner. The 3rd, separate room which is a bit hidden behind the bar has ms.pac man/gallaga, pinball games, and board games lining the shelves. It gives you the feeling that it’s okay to hang out for a while and pretend you’re still in college. Last edited by laikom on March 6th, 2012, 12:27 pm, edited 2 times in total. Great restaurant and great post. I've only been to Bad Apple a couple of times (mainly because only learned about it recently), but for all of the above reasons I find it a perfect neighborhood restaurant. It's a GNR in my book. Yes, but where the heck is it? Athena wrote: Yes, but where the heck is it? We accept reservations Monday through Wednesday for parties of 8-12. The Bad Apple cannot accept parties larger than 12 people. Of the burger-focused spots in the city, I can't think of a better place. It's always packed on weekends, often packed during the week, and I think one big reason is because of their great beer program. So the fact that they are so obsessed with the quality of the burgers impresses me that much more. In my opinion, Kuma's gave up a bit on that effort some time ago. But Bad Apple consistently turns out fantastic burgers - excellent quality beef, perfectly seasoned, and always cooked as requested. To me, that's what matters in a burger. I only like (and don't love) their fries, but with burgers and beer this good, I'm willing to make small sacrifices and accept mere pleasure on the spud front. One other important note: Bad Apple has one of the nicest staffs I've experienced in Chicago. I really like the people that work here. No matter how busy they are, they go out of their way to pay attention to their guests and you get the sense they really enjoy working there. So a big yes for me to this nomination. Been there for beer a few times and now for lunch and I fully support the as a GNR. Really great burger, wonderful beer list and nice staff. This is a big yes to me. The food is excellent. 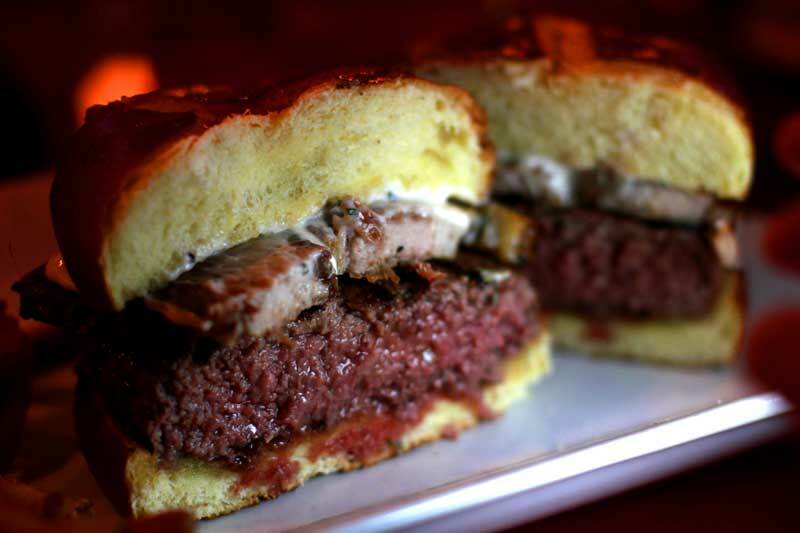 I had the Belly burger and it was one of the best things I ate in 2011. The beer list is top notch and the prices are lower than most other places. I'm fortunate to have the Bad Apple IN my neighborhood so easily agree about the G, the N, and the R. Having been turned onto the Bad Apple some time ago I've never felt the need to try to return to Kuma's. An encyclopedic beer selection (2 dozen taps and a gross of bottle selections!) - with knowledgeable and pleasant staff to guide you should you so desire - comfortable space, and outstanding burgers. I'm partial to the Slow Burn (Stout sauteed chiles with bacon and cheddar) and the Red Dragon (brisket hash, egg, pepper jack) while Mrs. Kman likes the Chupacabra (goat chili, roasted garlic, goat cheddar). Anyone we've brought or sent to Bad Apple has enjoyed it and thanked us for the reco. GNR worthy, you bet. Made my first trip to Bad Apple tonight which is sad considering it's about a mile and a half from my house. Especially sad because I really, really enjoyed it. Beers were terrific--had the 5 Rabbit Huitzi and the De Dolle Dulle Teve. The slider sampler was perfect for my first visit--the porchetta, foie and wagyu burger with a fantastic blue cheese were all delicious. Especially liked the tiny ciabatta bread that was so light, slightly sour and crusty--no pulling or disintegrating. S.O. kept it simple with the Bad Apple burger and devoured it in what seemed like a few seconds. Fries were forgettable. Got the firepower (?) salt which was fine but there were maybe 3-4 fries in the whole batch that had any crunch--so strange that with their obvious concern for turning out a great burger that they don't give some thought to what might bring those fries back to life...oh well. Loved the laid back atmosphere, good music, friendly service, spacious tables and overall good vibe of the place. Can't wait to return. Seems like a GNR to me!! I actively dislike the fries at Bad Apple, but I love everything else there. And they'll happily substitute a side salad for the fries for a very small up-charge, so that's not a big deal. I met up with some other LTHers at The Bad Apple over the weekend (some by plan, some by coincidence) for my first visit. Because of their much-lauded beer offerings, it had been on my radar for quite some time but it was laikom's nomination that finally got me over there. Overall, I enjoyed the experience. The tap list was great, as was the extensive bottle list. There are only a handful of places in town I know of that are offering a list of beers at -- or even near -- this level. We ordered burgers and fries. Burgers were good but did not blow me away. I find the comparison (made by others) to Kuma's to be a good one since many of the burger offerings are tricked-out, multi-topping jobs. I should have gone with my gut and ordered the simple Bad Apple burger but I ended up splitting the Peppered Kraut (peppered bacon and onion sauerkraut, muenster cheese, dijon mustard on a pretzel bun) and the Red Dragon (brisket hash, over easy egg, pepper jack, roasted red pepper sauce) with my wife. Again, my bad but under all the extras, it was hard to get a sense of the actual burger. Both were slightly overcooked (we ordered rare) and both seemed to have a heavy, overly-salty char on the exterior. Tasty enough but not a style I love. Being my first visit, I don't know if this was exclusive to the burgers we ordered or if all patties are treated similarly. Fries -- one order of regular, one order of 'firecracker' -- did nothing for me. I definitely plan on going back. I'd like to experience it again at a less-peak hour when I could relax and enjoy a burger and a beer or 2. Based on this single, Friday-evening visit I really can't say whether I think it's a GNR or not. It seems like the kind of place where you'd have to spend a lot more time than I have to get a real sense of that. I'll add my enthusiastic approval. This has been a regular spot for us since day two of operation, and I still haven't found a burger I prefer--only wish they would bring the Mahalo and Hammertime back. That said, the beef stands well on its own. I really appreciate their commitment to continuous improvement--building off their core strength of burgers, they have repeatedly impressed me with other sandwich options. They've kept their craft beer selection fresh and the beer prices are extremely favorable compared to places with similarly extensive lists. The staff really make you feel welcome and lack the pretentiousness and beer snobbery sometimes found at other establishments; and, it's been largely the same group since opening--to me this adds to the "neighborhood factor". GNR in my book for certain. Jonathan and I went for the first time and had lunch today. We brought the one month old baby and had our first experience of "being put in the room for people with children." Worked out fine though as all the kids, including ours who slept the entire time, were well behaved. I had the Earthly sandwich and it was truly destination-worthy vegetarian bar food. The truffled goat cheese, caramelized onions, and juicy portobellos worked in perfect harmony with the rosemary focaccia bun. I skipped the fries and had a small side of the chickpea salad which was light and fresh. Jonathan had the BBQ Brisket sandwich which he devoured. I stole a few of his curry-spiced fries and thought they were very good. As has been much discussed, beer list is pretty awesome. We enjoyed a couple. Service was nothing special, but efficient/fine. As it was our only visit, I don't feel like I have enough data to vote yay or neigh for GNR, but I will say that as of now we plan to return to explore more of both the food menu and the beer list. I would definitely lean towards "yay." I'm lucky that there are quite a few bars near my neighborhood that have great craft beer lists. The Bad Apple, however, is in a very small group of bars where I know I can get a great burger with my beer. * I tend to prefer a more simply topped burger, but the quality of toppings and well-matched combinations at Bad Apple have brought me around to this style. In particular, I really like the Belly Burger (braised pork belly and herbed horseradish mayo), Slow Burn (sauteed peppers and onions, bacon, cheddar), and especially the Chupacabra (braised goat chili, roasted garlic, goat cheddar, avocado). The fries, ordered extra crispy, are very good (though I really dislike the housemade "ketchup"). Service is consistently good, and the place has a friendly neighborhood vibe. I like the Bad Apple a lot, and I support its nomination as a GNR. *Current GNR nominee Owen & Engine happens to be another on this short list. I've been to the Bad Apple a few times. Maybe it's when I've gone (usually Friday early evenings), but I've not had the same warm fuzzies mentioned by others. Not that my experiences have been bad or unpleasant; they've not been memorable. That makes me somewhat indifferent on a GNR for the Bad Apple. I had never been into the Bad Apple until it's GNR nomination, but I've gone several times since and I'm very impressed. Fantastic beers, great food, friendly staff and a crowd of regulars that makes me wish I lived closer. Count me as a fan of this nomination.